On the morning of 28 March 1979, pumps feeding water into the steam generator at Three Mile Island’s No.2 (TMI-2) nuclear reactor near Harrisburg, Pennsylvania, USA, failed. Emergency shutdown systems appeared to have worked correctly – but they hadn’t. Like all nuclear power plants, TMI-2 used the heat energy produced by nuclear fission reactions to turn water into steam. Just like a power station burning coal or gas, the steam pressure then turns a turbine that spins the electrical generator. However, nuclear fission doesn’t just generate energy. It also produces dangerous waste products like radioactive caesium, iodine, strontium and plutonium. Some remain highly radioactive for hundreds of thousands of years. Unlike the later disasters at Chernobyl and Fukushima, a major release of radioactivity was avoided at TMI-2 – but only just. For 16 hours, plant operators struggled to make sense of their instrument readings. A faulty control panel meant they didn’t realise that a safety valve had jammed open, allowing coolant to escape and the reactor core temperature to soar. By the time they had worked out what was wrong, half of the uranium fuel had melted. The damaged TMI-2 unit had to be permanently closed. 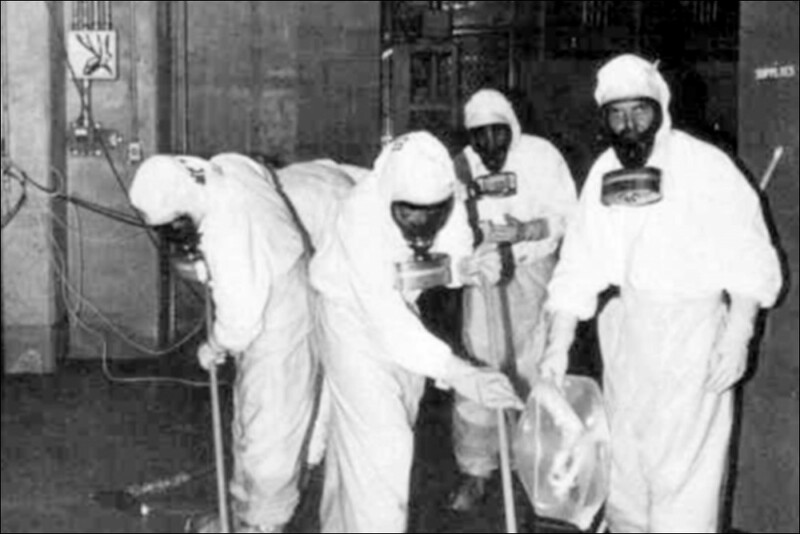 It took 14 years and $1 billion to decontaminate the plant by removing two million gallons of radioactive water and putting over a hundred tons of debris and fuel into secure storage. The nuclear power industry claims nobody suffered health effects from the radioactivity that was released during the TMI-2 incident. However, that is disputed by local cancer sufferers who blame the accident, and the government’s attempts to play down the dangers at the time, for their illness. What’s certain is that the Three Mile Island accident dealt a severe blow to the idea that nuclear fission could provide safe, clean energy. The US government was forced to introduce more stringent construction and safety regulations. This put a further squeeze on the profits that could be made from building hugely expensive nuclear power stations. The 1986 Chernobyl disaster, when a fire in the graphite core of a nuclear reactor released radioactive plumes for ten days, fuelled public opposition further. In the USA, over 100 orders for new reactors were cancelled and no new plants were approved until 2012. The advocates of nuclear power then tried to reinvent fission as ‘green’ energy since, unlike burning fossil fuels, it does not generate the greenhouse gases that cause climate change. However, the 2011 Fukushima disaster then provided another deadly reminder of the disastrous consequences of systems failure in a nuclear power station. The disaster at Chernobyl was a product of an impatient, unaccountable Stalinist Soviet Union bureaucracy pressuring technicians into a reckless experiment aimed at speeding up repair times. Fukushima was the product of a reckless private operator, the Tokyo Electric Power Company, ignoring the risk from tsunamis and earthquakes. But could these risks be avoided if nuclear power was part of a nationalised energy system under workers’ management? A genuine safety culture could reduce risks but, just as at Three Mile Island, the chance of human error and mechanical failure is always present. Even if an accidental release of radiation is avoided, every radioactive reactor eventually has to be decommissioned, at huge cost, when the power station closes. They can’t just be dismantled like an old factory. The radioactive material has to be safely and securely stored for many thousands of years before its contents could be safe to release into the environment. A 2018 government report estimates the cost of cleaning up just the UK’s 17 nuclear sites could be over £200 billion. Many of the UK’s nuclear power plants are already operating beyond their originally planned lifetimes as it is. The Hunterston B reactor in Ayrshire has been out of action ever since 370 hairline cracks were found in its ageing graphite core. They can’t be mended so EDF, its private operator, has applied for permission to increase the safety limit to 700 cracks instead! The fact that only one new UK nuclear power station is under construction, Hinkley Point C in Somerset, is because the economics of nuclear power is now so clearly flawed. This white elephant, a legacy of New Labour’s Tony Blair and Gordon Brown’s support for the nuclear industry, will, if its technical flaws are overcome, end up being the most expensive power station ever built. The cost will be met by bill payers through a deal that guarantees that EDF will be paid about twice the actual going rate for the new reactor’s electricity output. Not everyone has struck lucky like EDF. Hitachi and Toshiba have pulled out of their plans to build other new nuclear power stations planned for Wales and Cumbria. In Pennsylvania, the remaining Three Mile Island No.1 reactor is itself facing shutdown this year – not through any accident but because it’s been making a financial loss. Instead of continuing to subsidise risky and expensive nuclear power, urgent investment is needed in the further development of wind, solar and other renewable sources while rapidly improving energy efficiency. Energy generation and transport industries should be part of a nationalised environmental plan of production. This is the only solution to urgently tackling climate change while also providing skilled jobs, particularly for those presently employed in the nuclear industry. Austerity-ridden capitalism is unable to make the investment needed to rapidly and safely phase out nuclear power, far less the global plan needed to tackle global climate change. For that, socialist change is needed.